Many years ago during a very trying time in our orchestra’s history, our attorney Phil Sipser advised us to take a much more active role in interfacing with our audiences. In those days the only time the public ever heard from the musicians, except for our music, was during difficult contract negotiations. Mr. Sipser told us that going to the audience only during the hard times was disingenuous. Although the committee knew he was right, this was not something we really wanted to hear because it would mean a lot of work for us. We did however take his advice, and the musicians formed our own non-profit organization called the Musicians of the Houston Symphony (MOTHS), which began in 1990 to publish our quarterly newsletter called Upbeat. This was in the days long before the Internet as we know it now— e-mail was just beginning to be used in universities. The musicians wrote articles about what rehearsals were like, and how we make reeds; we wrote profiles on musicians and board members and other articles that would connect our audiences with the musicians. We published Upbeat for about 10 years. Another way that MOTHS sought to connect to our audiences was by performing chamber music “salon concerts” in people’s homes, beginning in 1997. The idea behind this type of concert was to give small audiences a very close and intimate view of their HSO musicians playing. Today these concerts continue in our concert series Music in the Sky, on the top floor of the Chase Tower. The Musician’s Portrait project also grew out of the early MOTHS organization. 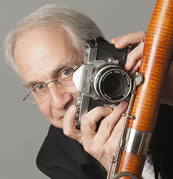 One of my dreams as a photographer and musician was to do a series of portraits of my orchestra colleagues for just the purpose that Phil Sipser envisioned, that is, to make a strong connection between the musicians and our audience. By taking over the process and doing it ourselves, we were able to spend the time necessary to bring out each musician’s personality in the portraits. The project took about three years and was completed in time for the orchestra’s centennial season. It is permanently displayed in the lobby of Jones Hall. The effect of it has been a very positive one for the organization overall. Audience members have told me (as the photographer) and also many of my colleagues how much more approachable the portraits make the musicians feel to them. Our management has reported similar feedback from the audience. When I go out into the lobby there is always a crowd of people gathered in front of the wall, talking about their favorite musicians. This project is something other orchestras could do to bring musicians and audiences together. It seems to me that there are always excellent photographer/musicians in our orchestras. Having portraits made by one of the orchestra’s colleagues rather than an outside photographer will often be more successful because the making of a portrait is a very intimate thing. Unless the sitter is comfortable during the portrait session and trusts the photographer the resulting portrait may be rather stiff. Also an inside photographer will have more of a vested interest in doing his or her best for his or her colleagues and the orchestra. For me the entire project was very rewarding. I approached each sitting as a real collaboration, and I think most of the musicians found the process quite enjoyable as well. My initial plan had been to mat and frame each photograph and hang them on the wall. However our management brought in Alan Krathaus of Core Design to finalize the display. I was completely surprised and delighted at his result. As you can see from the photographs of the finished wall, this approach is extremely clean and elegant. 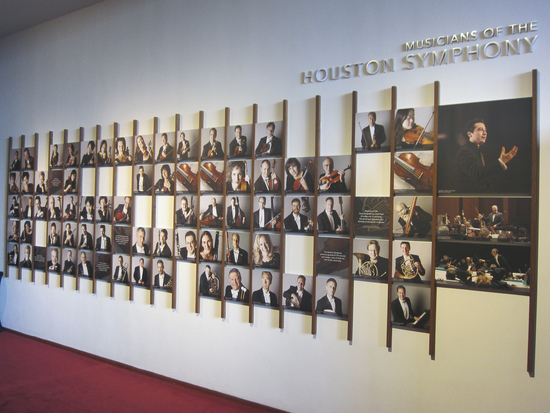 It also allows an easy way to change out photographs when musicians retire or join the orchestra. Contact me directly if any of you would like to explore a project like this in your orchestra. I would be more than happy to discuss the whole method from beginning to end, from the portrait sitting strategy and techniques to the final display options. This project would not have been possible without the support and cooperation of our general manager Steve Brosvik and his assistant Kathryn Wene.